I've been curious about toys like this for a while, but with the highly rated ones being well over my budget, my attention turned to a cheaper one. I had figured it wouldn't work, why else would it be less than $20 when the others were 70+? This felt like the right way to decide if I wanted to drop more money on the more expensive fancier options. Easier to try something cheap and if it worked to any extent, then save up for the more costly option. Yet I was pleasantly surprised by the box. It gave you that "official" impression that felt like this might work. Most things I end up ordering don't come in boxes- just plastic. Which I care about needless packaging, and prefer something I can recycle easier. Funny thing was that I had ordered three things when it came, but it was the first thing I grabbed and ripped open. The other two things haven't even BEEN opened or tested yet, because this bad boy has skyrocketed to my fave list. I noticed it had a nice heft, not too heavy but fit the hand nicely. Though while the batteries were confusing to get in (I fought with it for five minutes), once I figured out how to turn it on the hum was very faint. It has a soft glow to let you know it is on yet it is not noticeable. This is an easily concealed toy. As for the first time, honestly, it was amazing. It didn't tug painfully (like I feared it might), it was gentle but enough, and it was quick to get the job done. I'm an easy person to please, I like to lay in bed under the covers all warm and toasty, and this being silent makes a living with a nosy cat and even nosier house occupants a lot easier than my industrial wand. Plus I swear it got me there quicker than my magic wand. The vibrations aren't necessarily "strong", but it is powerful. I'm not sure how to describe it, but the suction seems different than your typical vibrating bullet. It's not that it doesn't vibrate, just that it's like a little fan in reverse. I think anyone who likes suction would like this, versus the difference in power for power queen/kings when it comes to vibration. Since my first use, I pretty much use this every day now. It's become my absolute favorite toy. Although turning it on and off is hard (usually it's a lot of dumb luck for me, but thankfully the quietness of it doesn't make it awkward if someone came around while you try to turn it off). It's lightweight, and you can increase the pressure. For transmen with growth it works well too (which was another factor I was a little concerned about if I'd be too thick for it). I even tested the waterproofness, as it's advertised to be, and can confirm that in a bath with a bath-bomb and wine, this toy is just as nice if not better. I personally don't bother with lubes on this toy, since one wrong slip, and you lose suction, and I keep it on the lighter level, so it isn't risking tearing. But my preferences are not universal and do what makes you feel more comfortable. 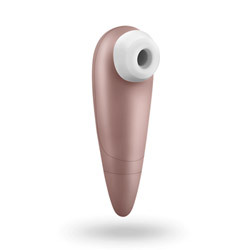 Vibrations are located in the head and felt through the suction. When it comes to orgasms, this toy milks it out relatively easy. I haven't played around to find more interesting things to do, as I am very content with what I'm doing now (just keeping it on me while I scroll mindlessly through social media). It's good enough, I don't feel the need to explore more. One major tip though is to situate yourself before turning it on and pull it off before you turn it off. Because the off button is tricky to figure out and you can get overstimulated otherwise. Thank you for viewing Satisfyer 1 – contoured clitoral massager review page!